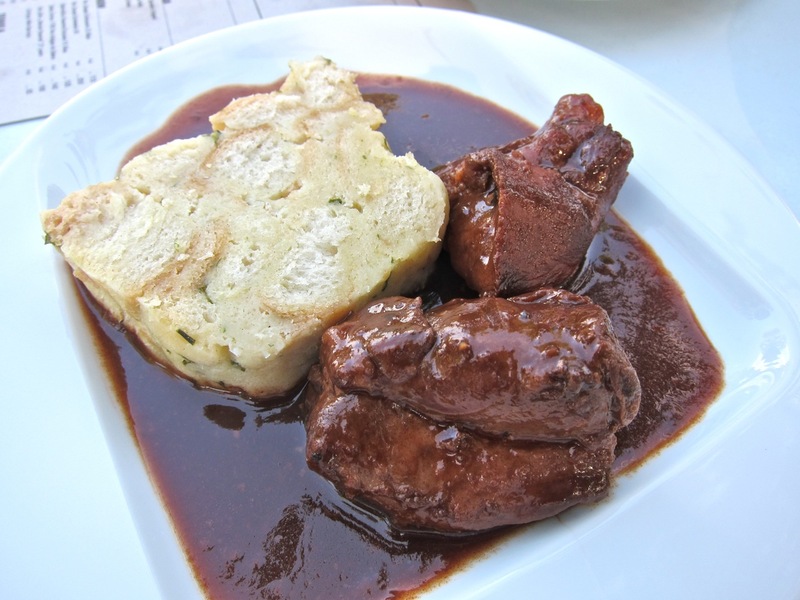 People used to call the Czech Republic a culinary backwater. Some still do. Ten years ago, I'd agree with them. While this country doesn't have the depth of the great world capitals, it does have world class quality. Assembling much of it in one place is something to behold. That's what the Prague Food Festival does. It is the event of the year for foodies: a perpetual showcase for more and more inspiring restaurants. I've only missed the fest once since it began. 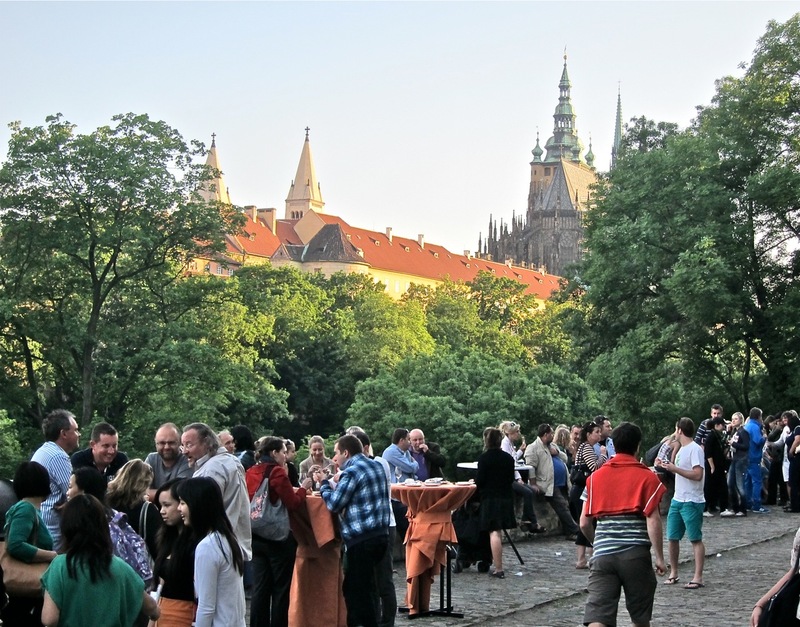 This year, it returned to the fairy tale-like setting of Prague Castle's Royal Garden. It is the best of the locations they've used, and I hope it stays there. The deal remained the same this year. 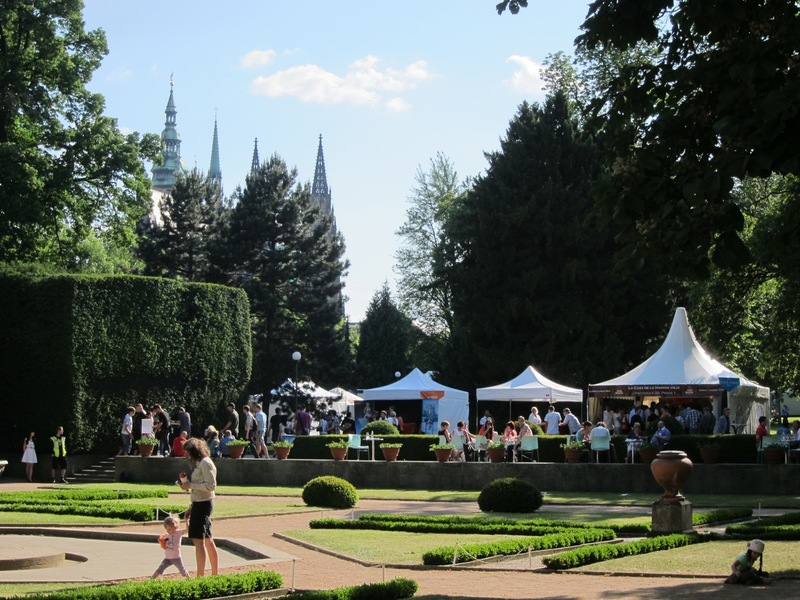 It cost 400 CZK to get in, which includes 250 CZK worth of food tickets called "Grands." 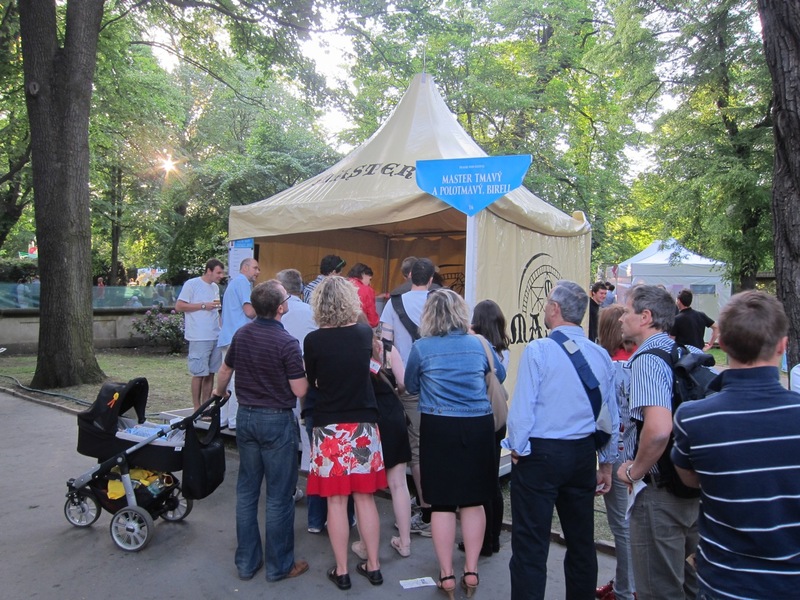 You buy more books of 10 tickets for 250 CZK as needed. And you will need. I attended with my Italian companion on Friday evening. We enjoyed good weather and almost no lines. I was warned Saturday would be the busiest day, but several people told me Sunday was actually busier, with occasional 15 minute waits for the most popular offerings. 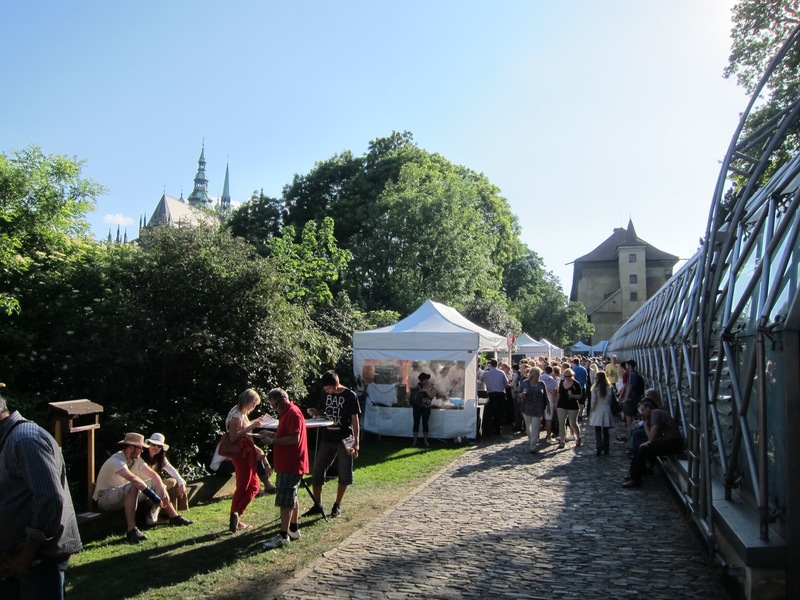 The festival tried to manage the crowds more efficiently this year by selling tickets with entry times. Mid-day slots were sold out in advance. The event was founded by Pavel Maurer, who publishes the Grand Restaurant guide. One welcome new addition this year was much more seating for diners. My only criticism is that many dining areas were not close enough to where food was being served. I mostly ate while standing at the small tables near the food tents. You had to be lucky sometimes to find a free spot. We started off in the lower garden. The first place I hit was V Zátiší. I've greatly enjoyed their offerings in previous years. This was no exception. They served slow-roasted lamb, organic quinoa, lemon yogurt, and lamb jus (150 CZK). 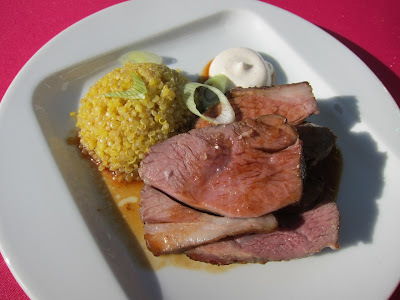 I love lamb, and I loved this. The meat was rare and tender, if a little too salty. The jus caught the essence of the meat. A dab of that and the tangy yogurt sauce made for a lovely bite. I really dug the quinoa. I wish it would appear on more menus. We moved up the narrow path to try Le Patio. Chef Sofia Smith has completely redone the restaurant's menu with an Asian theme. 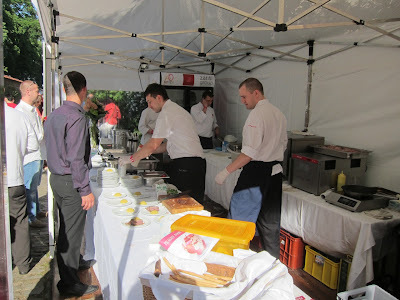 There were so many tempting options like slow-cooked Indonesian-style organic beef or calamari confit. 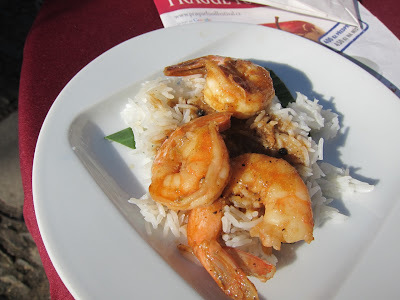 I settled on Singapore shrimp with black pepper, curry leaves, and green chili served with rice and banana leaf essence (125 CZK). The three small shrimp were properly cooked and had a delicate crunch. The sauce certainly provided a peppery heat. I wished there was more of it to coat the rice. It was gone all too quickly. The next stop was La Truffe. I've heard good things about this truffle-inspired restaurant. It's not cheap though, and their dishes carried the top price of 250 CZK. 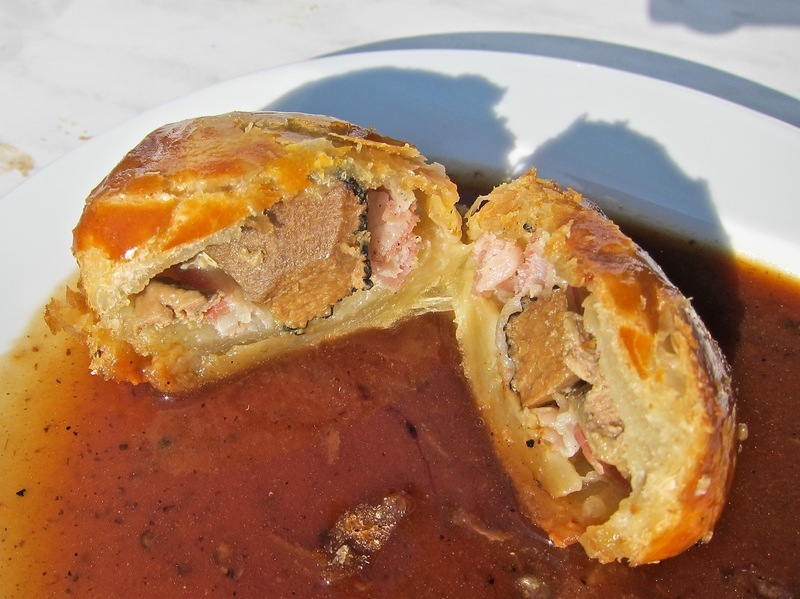 I had the puff pastry filled with baked black truffle, a slice of foie gras, and pancetta on a sauce Bordelaise. I sliced it in half for further inspection. There was a decent-sized chunk of the dear and subtle flavored mushroom inside. It was somewhat overwhelmed by the other ingredients. The foie gras didn't fare so well in the cooking process and didn't have the smoothest texture. The pastry was nice. Surprisingly, the sauce, made with a rich demi-glace, was the best part. Thick and beefy, with a hint of wine, it was so damn good I licked the plate, even though I know this mortifies my more refined companion. The dish got a tongue lashing and so did I. 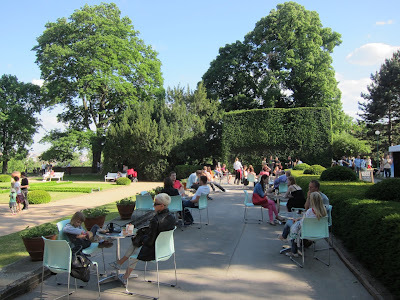 We walked back to the upper garden and went to Alcron at the Radisson Blu, which received a Michelin star this year. Here we purchased their dorade (sea bream) with candied eggplant purée (150 CZK). The fish was simply done, and the Italian lady liked it very much. I thought one part of the fish had gotten a little dry. 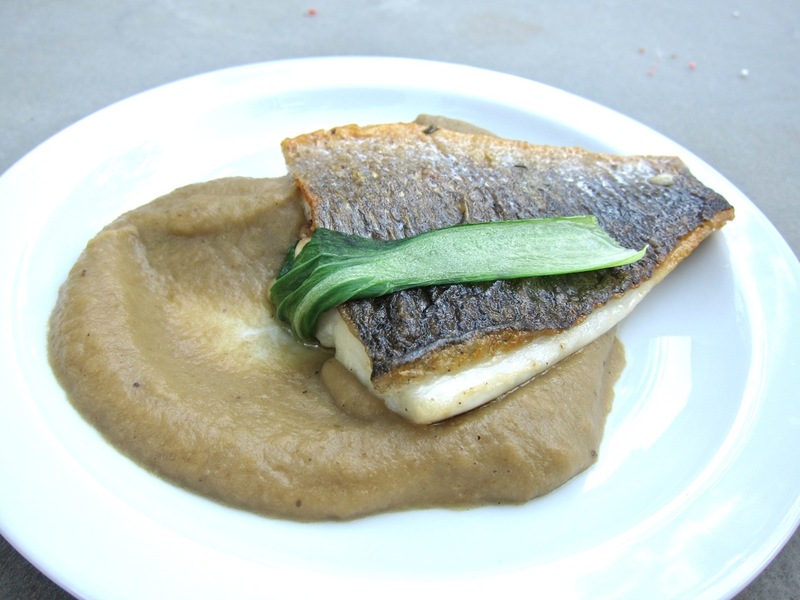 In any case, the quite sweet purée balanced well with the flavor of the fresh fish filet. 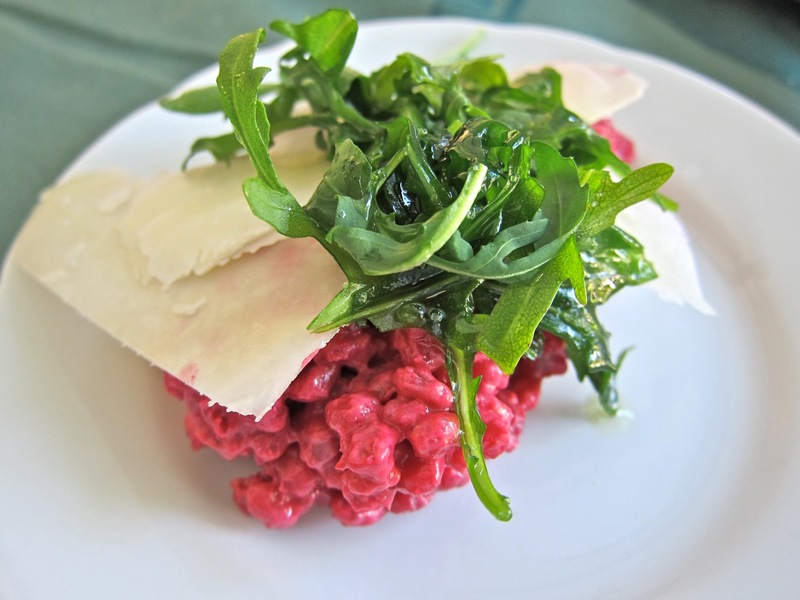 Le Grill Restaurant at the Kempinski had an interesting creation: barley risotto with beetroot juice, goat cream cheese, and rucola, topped with Pecorino (100 CZK). My friend and I split on this. She loved the combinations of textures and flavors. I thought it could have been great, but I found it too salty. The Pecorino was quite intense by itself. Not far away, we checked out U Zlaté Studně. This restaurant got the most diners' votes for best restaurant in Maurer's Grand Restaurant guide for 2012. We tasted the pork loin cooked sous-vide, served with a sauce of smoked bones and mashed potatoes with truffle butter (175 CZK). The meat was so tender. The vacuum bag cooking method gave it a wonderfully silky texture. The creamy potatoes, with the strong flavor of truffle, were fantastic. My companion is not a big meat eater, and she actually went back for a second portion of this. It doesn't get much better than that. We also tried their goat cheese mousse with marinated green asparagus and a spicy honey sauce (100 CZK). 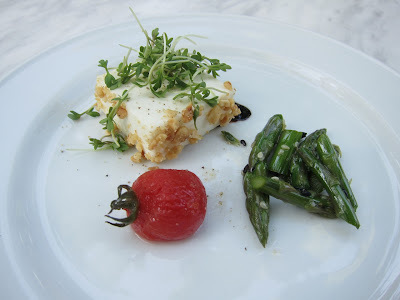 The cheese was light and creamy and the tiny asparagus was surprisingly sweet, but with none of the expected sharpness. It was nice, but nothing to write home about. We realized we needed something to drink. A bottle of Mattoni could be had for 25 CZK. For the same price, one could have a glass of Master beer, a premium brand by Pilsner Urquell. Unfortunately, when I tried, only one tap was working, and painfully slowly at that. We waited in a line that didn't move for a while and gave up. A few others did as well. We saw a restaurant I often recommend, U Emy Destinnové. First, I picked up the ceviche of Yellowfin tuna with coconut-ginger-lime vinaigrette with toasted sesame seeds (125 CZK). The ruby red little cubes of fish were pristine and I liked the interplay of sesame, slivers of pepper, and the tangy dressing. 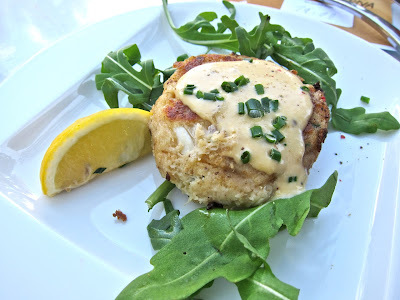 Then I tried their Maryland crab cakes with roasted corn sauce and chili (175 CZK). I was amazed to find that this was the real deal, with big chunks of genuine crab meat. I'm very particular about crab cakes and these tasted very good. I prefer them with slightly less bread crumbs, but it is a real trick to get them to hold together. I asked the American chef and owner, Steve Trumpfheller, where he got such precious seafood at an affordable price in this town. He told me his mother brought him something like 150 kilos. I've rarely seen this American dish served in Prague, so it was a rare opportunity for many to try it. While resting, we stopped for a glass of wine. Many were at least 75 CZK for a tiny glass, so we went for the cheapest option -- a rosé Merlot for 25 CZK. Neither of us liked it. That's what you get when you try to save money on wine. Bad idea. I like Krystal Mozaika Bistro and I used to be a regular at its sister restaurant, Mozaika. 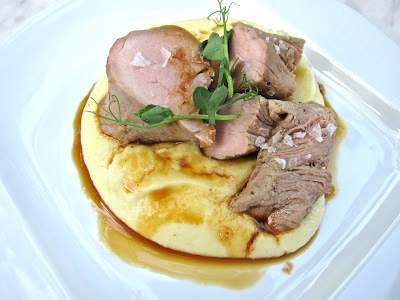 I tried their boar shoulder cooked sous-vide with red wine, served with an herb dumpling (150 CZK). The meat was tender and had good flavor. The sauce was OK, but was similar to the one served with the Beef Bourguignon at the bistro. You could taste the wine clearly, but it was too sweet for me. Last but not least, we tried the food from Rickshaw, the restaurant at the Corinthia Towers Hotel. 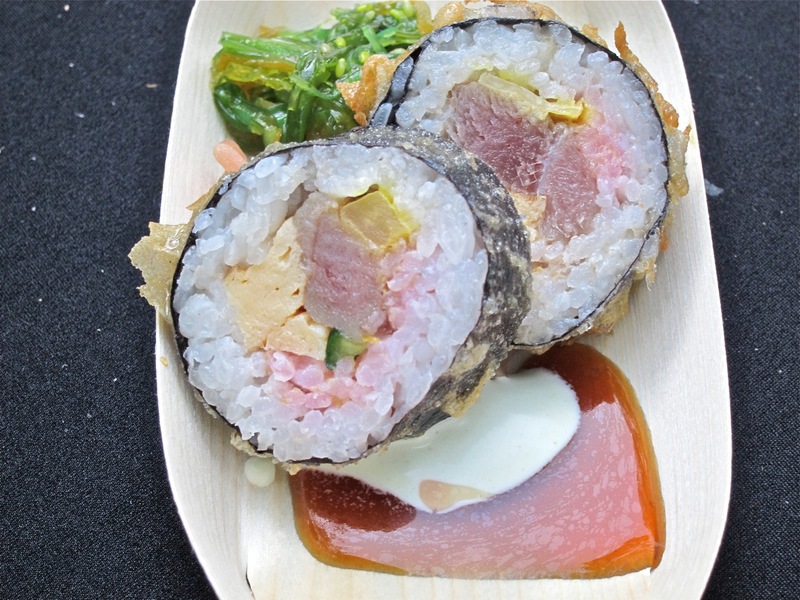 We had the tempura tuna and pickled radish roll with seaweed salad and wasabi cream (100 CZK). My date liked it. Everything was fresh and tasted fine, but I've just never found anything exceptional about sushi in Prague. Before I go, I should say something about the prices, as I heard a few complaints last year. We spent over 2000 CZK. That's not a cheap night out for most, but then again you could spend that for an evening at just one of these restaurants. Some of them can run even double that. For me, it's great to be able to sample them all in one place on one evening. I know I'd feel that way even if I wasn't writing about it. But I understand if not everyone feels the same. I'd also add that there were plenty of restaurants we missed for lack further appetite. 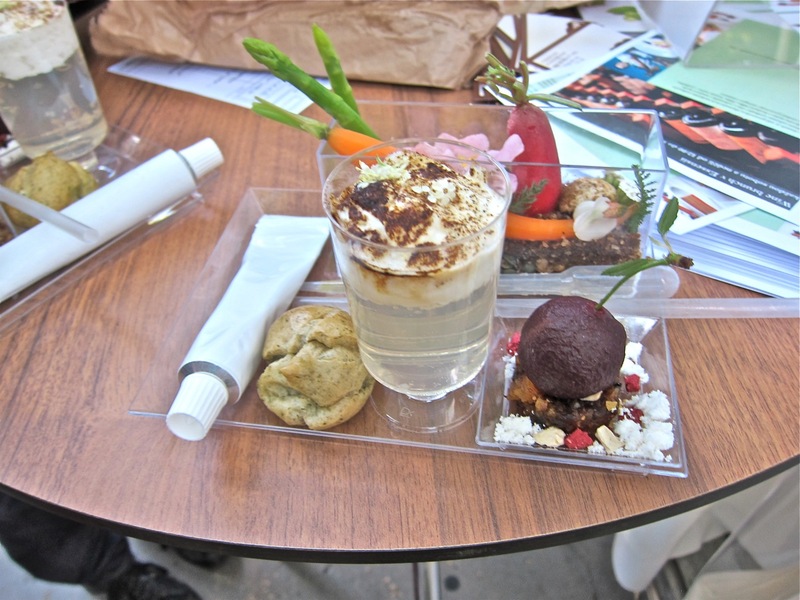 I was sorry I didn't taste the "culinary lab" offering from Essensia at the Mandarin Oriental. It looked interesting, and everything was edible, except for the containers. Top restaurants like Aromi, La Finestra, Bellvue, and Buddha Bar only served on Saturday and Sunday, so we missed those. But there's always next year. I'm still far from bored with the festival, so I'm pretty sure I'll be back for another visit to this garden of eatin'. That food looks so great. 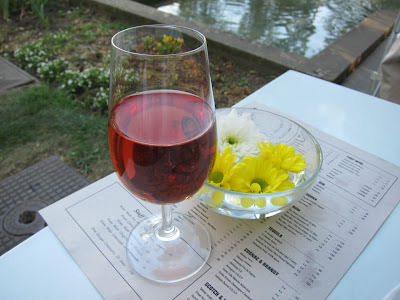 I was last in Prague a year ago and ate at Degustion (sorry I only found your blog today so don't know if you've been). Some of the photos remind me of that. Did you give a try to Angelato's ice creams? Perfect consistency (not too much frozen) and delicious taste. Saturday afternoon, sunbathing, a couple of scoops: was also a great moment of food! 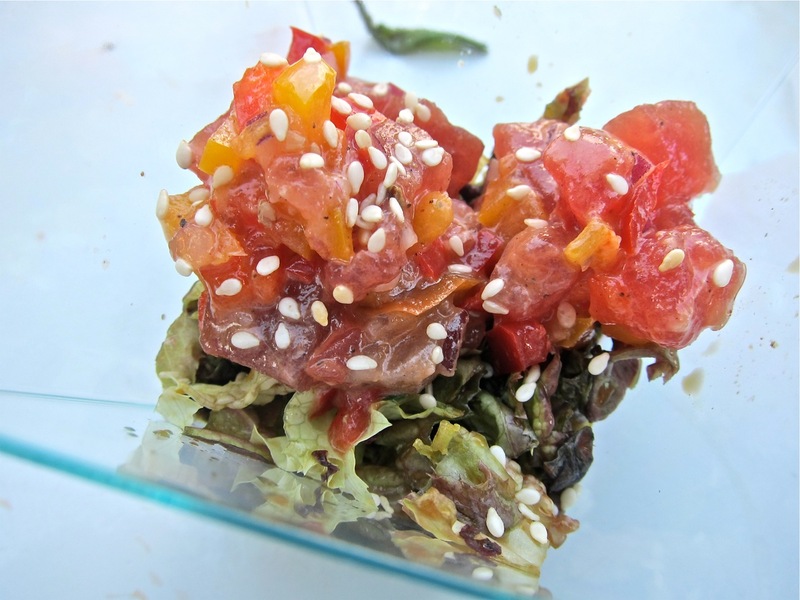 i wouldn't say the tuna and the raddish combo is the best. 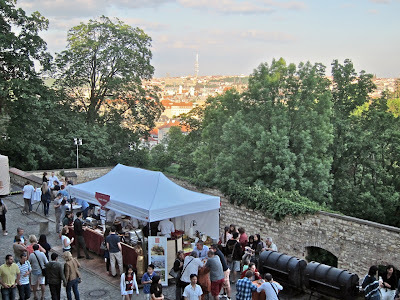 i wonder if u decided that sushi is just not that good in Prague, i guess there have been many disappointments before. "Hope is tomorrow's veneer over today's disappointment". ohh that looks so awesome! "Czech Republic a culinary backwater" who could possibly say that now?! 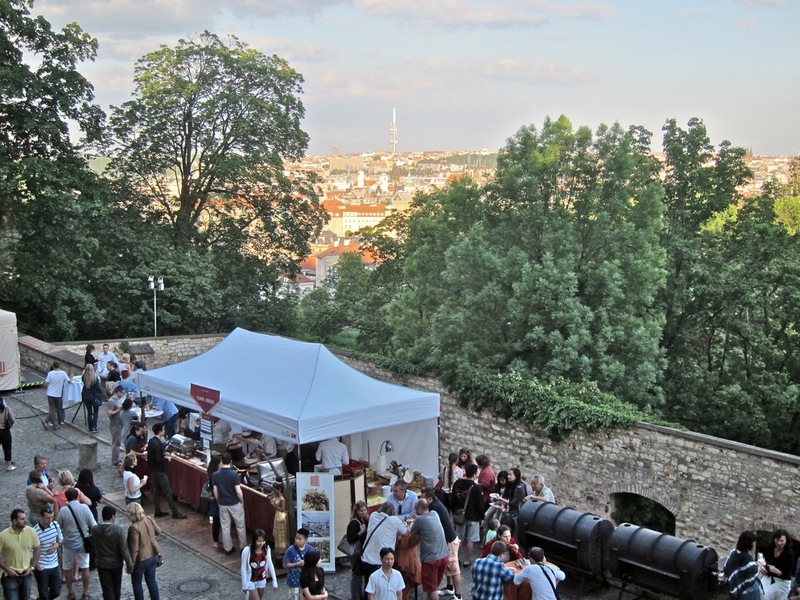 The Prague Food Festival is pretty well-known now as a food hotspot event that even my friends are thinking about visiting the Czech Republic around this time next year to have a taste. I just wish they'd use a little bit more greenery in the dishes... they're always so heavy on the meat! But I guess that's the national cuisine. I know a lot of people complain about the blandness of British cuisine, but I've always loved that too. The Czechs are usually very good at fish dishes, so it doesn't surprise me your bream was excellent. 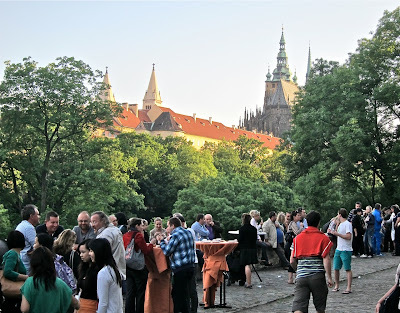 The last time we booked our city breaks in Prague we really enjoyed the zander they cooked for us. We keep telling ourselves to try the pike next time we're over there, but it's not as easy to find as it once was. I know they also offer an amazing smoked eel, if that's your thing too, and catfish is always popular. I'm like you with regards to crab cakes... I can't stand the flakey nonsense they serve in my country, but I'm an absolute sucker for the real deal with big chunks of crab. Thanks for sharing all these great photos!